Fruits Go Wild is a special, fruit themed slot with an RTP of 96.1%. Just like there is an abundance of beautiful and tasty fruit in the world, there is an abundance of fruit slots floating around in the iGaming world. That’s why this game is so special because it is not like all of the others and has visual effects including animations that stand apart from the rest giving you a refreshing feel to it all. The set up is three by three and has a unique 27 ways to win with different payout combinations possible as well. The minimum bet is € 0.1 while the maximum bet is € 20. The wild symbol is in giant bold, yellow letters with leaves hanging about in the background. One or more wild symbols in a winning combination is wild and substitutes for all symbols except for the free spins symbol. Whenever the wild symbol lands on the centre line, that reel will then hold for the following spin! The free spins symbol is a bright purple and has a few leaves coming out of the sides, too. If you land three free spins symbols, the free spins feature will be triggered. The free spins bonus round is activated once you land three of the free spins symbols on all three reels. Once the feature is activated, you will be shown how many wilds are added to this round and you will have a congratulations screen that pops up to let you know that, ’10 free spins awarded’ in bright gold letters! Then you click anywhere on the screen to really start the free spins round. At the end of the round you will be notified once again with a pop-up screen of your total winnings during that round. It will then bring you back to the base game reels where you can enjoy the calming music once again. Each time the symbol appearing in the middle window of the middle reel corresponds to the next symbol on the border, the border progresses by one. Wild also substitutes for all symbols and makes the border progress each time it appears in the middle cell. You can win up to 2,500x your bet once this feature is completed. The wild symbol is the highest paying symbol which can award you with 25x your total bet. The famous lucky seven symbol can award you with 5x your total bet. The gold bell symbol is the mid-range paying symbol which can ring you up to 1.5x your total stake. The zesty, sour lemon symbol can award you with up to 0.7x your total bet while the beautifully cut watermelon piece can award you with up to 0.5x your total bet. These are the one of a kind payouts that you can receive in Fruits Go Wild but, there are seven other combinations you can earn in this uniquely made slot. The music in the background is interesting and almost unexpected; it has a strong zen feel to it even though it plays the same phrases over and over again, it’s nice and relaxing. That is when the reels are at a stop. When you spin the reels, other sound effects are played but stop once the reels have landed in place. When you land winning combinations, the sounds change as well, sometimes sounding as if your phone is ringing but that’s a good way to make sure you are aware of when you’ve landed on something good! The backdrop behind the reels is a green layout with moving circles and swirls, adding an extra feel to the calming sound effects. Fruits Go Wild will have you dreaming of a freshly cut watermelon on one of those hot, sunny summer days. This slot is just as refreshing as it is to bite into watermelon on those summer days; with fun, rewarding bonus features and amazing visual as well as sound effects, this is one special fruit game. 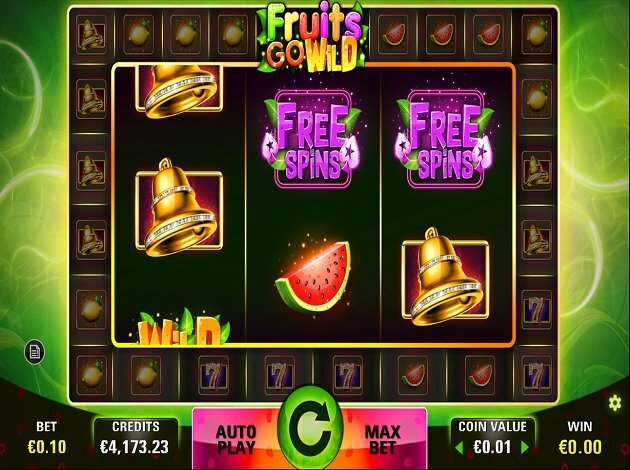 From free spins to sticky wilds, there’s plentiful to be satisfied with in this Fruits Go Wild slot from Seven Deuce Gaming. Play with us today at Videoslots.com!